Click here to preview sample pages from Pssst… Your Piano Teacher Thinks This Is Theory. If you like what you see, click the Buy Now button below to get your copy today. If you piano students start to cry when you break out the dusty, old theory books, get bored or restless when using a workbook, are struggling learners because they don’t understand the “math” behind the music or are prepping for exams, festivals, or competitions and need motivation to pay attention to the details on their page then Psst… Your Piano Teacher Thinks This Is Theory is the resource your studio needs. 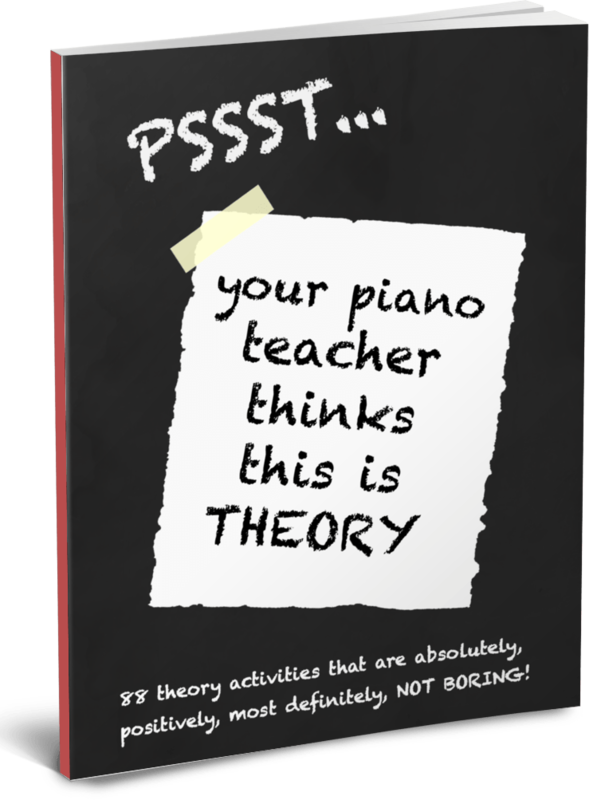 These 88 piano theory exercises that will revolutionize the way your students learn theory. Moaning, groaning, and grumbling will be replaced with giggling, laughing, and… learning!! We guarantee this book will make learning theory an exciting, enjoyable experience that is absolutely, positively, most definitely, NOT BORING!